Tina Luongo, Attorney-in-Charge of the Criminal Defense Practice; Adriene Holder, Attorney-in-Charge of the Civil Practice; Sharon Katz, Special Counsel for Pro Bono at Davis, Polk & Wardwell LLP; Daniel Kolb, Senior Counsel at Davis, Polk & Wardwell LLP and a Vice Chair of The Legal Aid Society; Richard J. Davis, Chair of The Legal Aid Society; the Honorable Rolando T. Acosta, Presiding Justice , Appellate Division, First Department Dawne Mitchell, Attorney-in-Charge of the Juvenile Rights Practice; Marie Ndiaye, Supervising Attorney of the Decarceration Project; Elizabeth Bender, Staff Attorney, Decarceration Project; and Joshua Norkin, Staff Attorney, Decarceration Project. 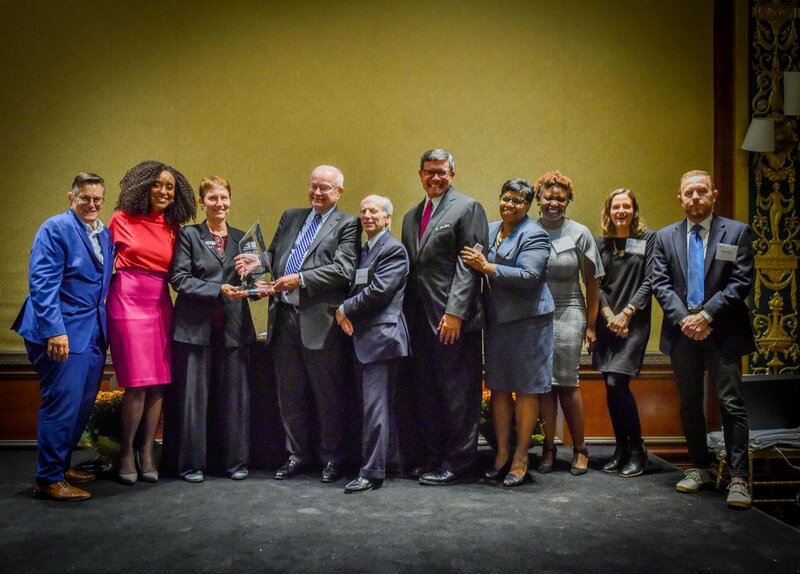 The Legal Aid Society hosted the 2018 Pro Bono Publico Awards Ceremony Wednesday evening. Davis Polk & Wardwell LLP received the 2018 Honorable Jonathan Lippman New York Pro Bono Publico & Public Service Law Firm Award. Law Firms and individual lawyers were recognized for outstanding public service. Special awards were presented to Attorneys Emeritus who provide pro bono representation to Legal Aid clients throughout the five boroughs.